This 74-acre woodlot was originally called Van Atta Woods Park when the initial 62 acres were purchased by Meridian Township in 1973 followed by additional enlargements over the years. In 2009 when the final acre was added from the family of Ted Black and the park was renamed after the well-known environmental advocate. Charlie “Ted” Black (1914-2007) began his career as a wildlife biologist before conducting postdoctoral research under Aldo Leopold, the founding father of wildlife ecology. Black made this slice of Meridian Township his home and was well known as an avid birder who field-identified more than 2,000 species over the course of his life. Black and his wife traveled the world as wildlife and botanical educators, guiding more than 25 birding and nature tours across five continents. During his 36 years with the Michigan Department of Natural Resources, Black made significant contributions as a wildlife biologist including leading the fight to ban DDT. In 2004, Black released his final book, the popular Birds of Michigan. Ted Black Woods can serve as a quiet escape from the often busy Grands River Avenue. Views of homes and a church are frequent but the trails do allow you to be immersed in the woods at times and even occasionally spot wildlife, including white-tail deer and sandhill cranes. 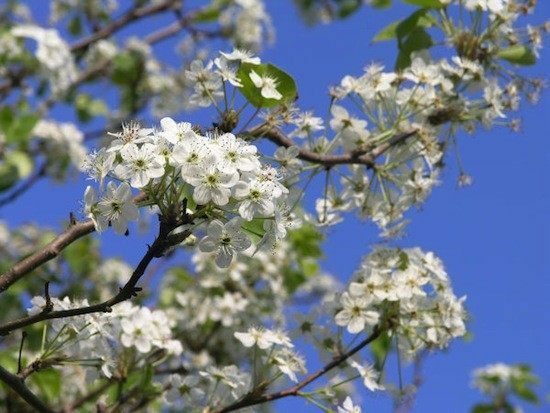 The wildflowers are excellent in the spring and the park can be an alternative choice when the Red Cedar floods out other Meridian Township parks such as Eastgate and Legg Parks. 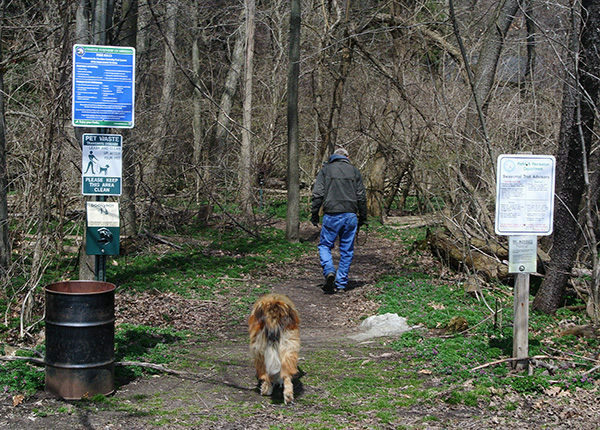 This 1.75-mile outing is the complete loop beginning at the Grand River trailhead. It’s rated easy and takes most hikers 30 to 40 minutes along the level terrain. 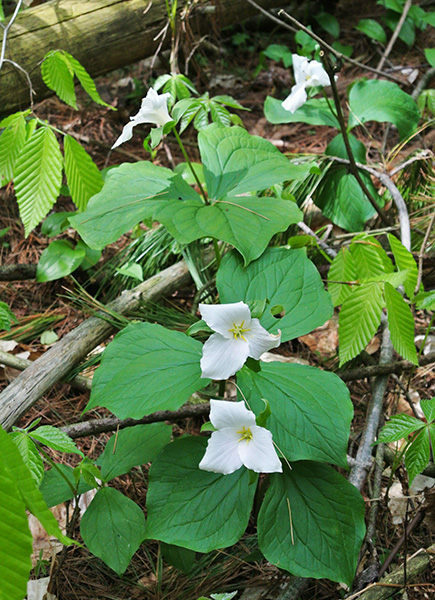 Keep in mind that the trail skirts several wetlands so mosquitoes can be a problem in late May and June. From the South Entrance along Grand River Avenue, the trail enters the woods and quickly comes to a bench surrounded by a scattering of large pines. To the left through the trees is the entrance drive and huge parking lots of the Red Cedar Church. The junction between the Yellow Trail and the White Loop is reached within a quarter mile. Head right to follow the trail in a counter clockwise direction and the junction to the Orange Loop is reached within a half mile from the trailhead. This back loop is by far the most interesting as it stays out of view of the homes for the most part. In the spring you can gaze out over a large wetland before arriving at a junction at Mile 1 with Black Trail, a short spur to the North Entrance on Van Atta Road. A little further along the loop is a bench on a low rise that allows you to sit and study another large wetland for possible wildlife sightings. Orange Loop merges back into White Loop at Mile 1.26 before returning to the junction with the Yellow Trail at Mile 1.5. The Grand River trailhead is just a quarter mile away. There are no facilities and no drinking water at the trailheads other than parking. A short drive south on Van Atta Road is the Harris Nature Center with water, bathrooms and interpretive displays. There are no fees at Ted Black Woods. The Harris Nature Center is open Tuesday through Friday from 9 a.m. to 4 p.m., Saturday 9 a.m. to 5 p.m. and Sunday 11 a.m. to 5 p.m. The South Entrance and trailhead is between Okemos and Williamsburg at 534 W. Grand River Ave., just east of Van Atta Road. 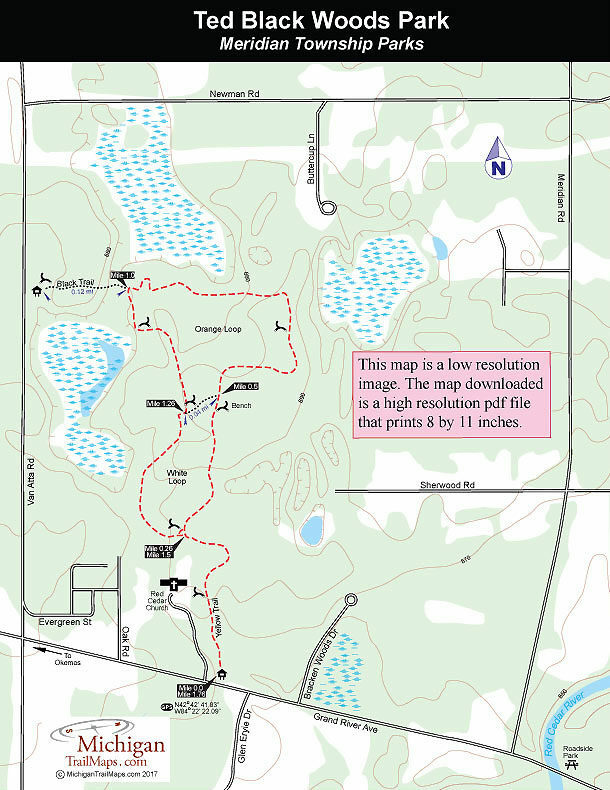 Less than a half mile north of Grand River Avenue is the North Entrance and trailhead at 4714 Van Atta Rd. For more information contact the Harris Nature Center (517-349-3866) or Meridian Township Parks and Recreation Department (517-853-4608; www.meridian.mi.us).